Google is taking its mapping off the beaten track and into the raw untapped beauty of British Columbia’s north, video and story. Tyler Clarke from Northern BC Tourism and a Terrace resident was the first to test drive the Google Trekker in the Khutzeymateen. Google is taking its mapping off the beaten track and into the raw untapped beauty of British Columbia’s north. The inaugural trek began at the Prince Rupert harbour where a three man team lugged a wheeled briefcase full of the expensive-looking gear onto the West Coast Launch’s Inside Passage catamaran. The Khutzeymateen grizzly bear sanctuary tour was the first destination for the portable Google camera. The trekker that will travel across Northern B.C. is in partnership with Northern BC Tourism Association, Destination BC and Google. A second trekker is covering the southern areas of B.C. “It’s a relatively new program. We have the trekker for three months and we’re one of the first destinations on the planet to be able to host the technology,” said Clint Fraser, the chief executive officer of Northern BC Tourism. In the north, Fraser plans to cover 1,500 kilometeres in three months starting in Prince Rupert, then capturing what he calls the four iconic corners of the north: the northern half of Haida Gwaii, the global geo park in Tumbler Ridge, Mount Edziza and the Spatsizi Wilderness Plateau. “We know that technology is drastically affecting consumer behaviour and it’s really effective to how travellers plan their trip and we know that this is a leading edge technology. What we’re hoping is that by using it and applying it to some of our backcountry that we can inspire people to plan a trip to Northern BC,” Fraser said. The Google Street View Trekker is also capturing iconic landmarks from around the world including the Pyramids of Giza, the Grand Canyon and the Galapagos Islands. This reporter came along for the ride to witness the trekker in action — and in six months time when the visuals go live — to compare what I saw on the tour with what the trekker captured. However, the people on board the vessel will have their faces blurred to protect their identity. This was my first time in the Khutzeymateen and it was difficult to wipe the smile off my face from the time the boat left the harbour until it returned seven hours later. First of all, the sun was shining. We saw sea lions, porpoises, a humpback whale, dozens of eagles and four grizzly bears. One of the bears was a gangly four-year old with big ears and dark eyes who stuffed his face with sedge grass while eyeing all the cameras pointed in his direction. The oddest camera on the boat was the Google trekker, with 15 lenses directed at all angles lodged into the spherical top end of the device. Tyler Clarke, the industry development specialist from Northern BC Tourism, and a Terrace resident, was the first to don the 40lb Google trekker that towers over his head. “It’s not nearly as heavy as I thought it would be. Definitely top heavy but a lot of the weight sits on your hips. It feels like a heavy backpack,” Clarke said failing to mention that it also looks like Google ripped it off from the original 1980s “Ghostbusters” set. The trekker takes five minutes to put together, 10 minutes to turn on and can run anywhere between five minutes or eight hours. Once the data cards are loaded, Northern BC Tourism will send it to Google and they will make the visuals seamless — much like Google street view. Clarke took the trekker out four times total, twice in the Khutzeymateen Inlet, then at Port Simpson or Lax Kw’alaams, and then he captured the Prince Rupert harbour. The beauty of the B.C.’s north is getting the international recognition it deserves. Perhaps tourists will be drawn to explore the area based on the images Google maps will soon provide or it can offer a glimpse of what the North Coast has to offer for those who will never get a chance to visit. 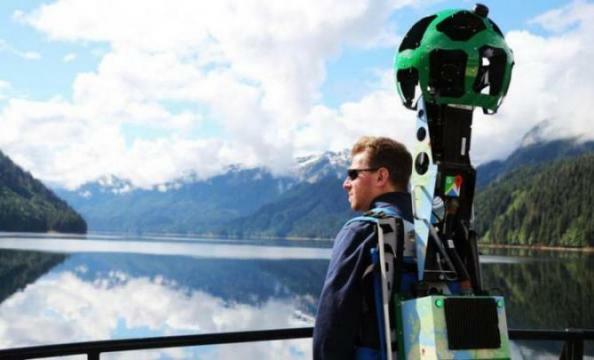 Follow the Google Trekker over the next three months through the Trek Northern BC website.